Why Travel With Torres Travel? 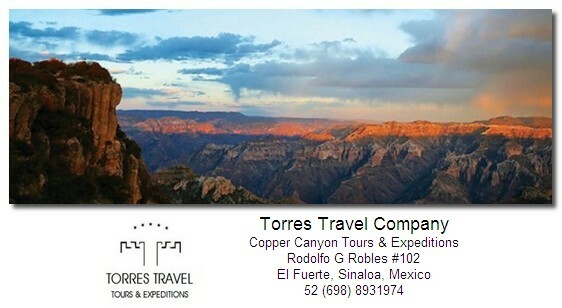 Torres Travel was founded in 2006, as a travel company dedicated to supporting nature, wildlife and conservation through responsible Copper Canyon and Coastal tourism and our aim is simple – to offer you a variety of exceptional tours and expeditions and service that you can’t find anywhere else. As a well recognized hotel, restaurants and travel company, we have formed unique partnerships over the years with some of San Carlos and Copper Canyon’s leading tour and activities companies and are able to offer our customer the best service to the Canyons as well as the coast. With a network of contacts and experts across San Carlos and Copper Canyon, our tours give you the chance to explore some of the most exciting destinations, alongside a bilingual specialists in Copper Canyon travel and and Coastal entertainment. As we take an active and leading role in advocating ways to find better and more sustainable business, environmental and social practices, by joining our tours, you are providing the economic, ethical and environmental incentives to conserve this areas for future generations. The future of tourism and travel needs to change. We aim to challenge the conventional approach to wildlife and wilderness travel and it is through people like you joining our tours that this can be achieved. Having personally visited each of the areas which we offer, our passionate and well traveled team will be happy to talk you through our group and tailor-made tours & expeditions to offer an authentic and exciting trip that’s right for you. Every client is looked after by one consultant committed to offering you very personal service. They will remain your point of contact, both before, during and after your trip and are happy to answer any questions or queries that you might have. In turn, each consultant is supported by an experienced and professional administration team, many of them have traveled extensively themselves. We are nationally recognized as a hospitality and travel company, the fact that 40% of our business is repeat and referral customers, gives us the highest endorsement we could have. Our staff have traveled extensively throughout the Canyons and the Coast in many cases have lived and worked there, so you can rely on their first hand knowledge and enthusiasm. They are some of the most experienced staff in the industry and will tell you about those little visited regions and introduce you to charismatic guides – those little extra qualities that make your holiday both unique and special. We insist that they regularly visit the Canyons and the Coast, forming new partnerships and strengthening established ones, keeping abreast of all issues relating to travel and wildlife and discovering new areas and places to visit. Like many tour operators, we subcontract the ground handling and logistics to a third party in the country of destination. The essence is to find a ground handler who has the same ethos as oneself so that clients are looked after in the way in which we would want them to be looked after. With years of experience and knowledge we have built up many longstanding relationships with our agents, ensuring that they deliver the level of service that our clients expect and that we demand – and that goes beyond the conventional. The quality of your guide can make the difference between a good trip and an outstanding one. The guides we use have been picked by us, or by our local representatives, as the best available and great care has been taken over their training, expertise and knowledge – they are the key to a successful trip and offer a real insight into their country. Some may even welcome you into their home and many clients do keep in contact long after they return home. It is little extras and personalized touches like these on the ground that make your holiday with us both distinctive and individual.